Either the cardpool has an undocumented maximum size of around 620, or I'm experiencing a very frustrating bug. When attempting to add additional cards to my card pool via the "Add a Pack" button, the program will "open" the booster pack, showing the cards that it generated... but the number of actual cards existing in the cardpool remains unchanged. This happens regardless of choosing to view the cards and then add them, or add them immediately without viewing them. Manually searching for the cards or opening the cardpool.txt file and looking for them reveals that these cards are never added and simply cease to exist. This happens consistently for me any time that my cardpool hovers around the 620 cards mark, and I have reproduced the issue consistently both by loading a backed-up cardpool and adding cards until reaching the ~620-630 card mark (at which case it bugs,) or deleting the cardpool file and starting from scratch and then adding up to the ~620-630 mark. This occurs with the 10-14-09 version of Lackeyccg on the WoW TCG Plugin. I have not yet tested the Magic plugin, but I recall a similar issue forcing one of my players to redraw their entire cardpool. Edit: One more important thing. I seem to be experiencing a second, possibly related bug regarding sorting of the cardpool. When applying any sorting parameters to the cardpool on the left hand side, I will spontaniously get a number of "duplicate" entries in the cardpool. 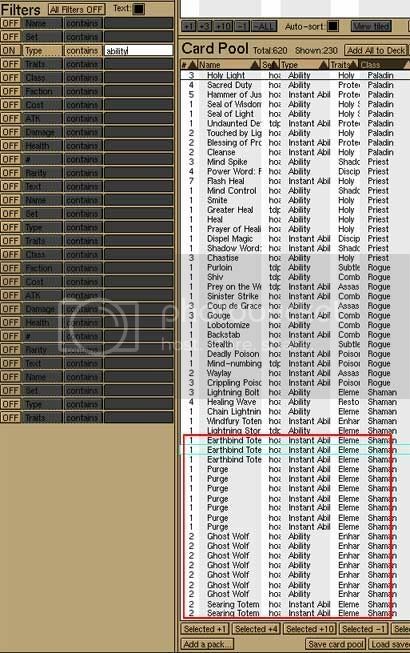 These duplicate entries do not actually manifest themselves in the cardpool.txt file, nor will searching for them by name return all of the bugged entries. I have about five or six active players between the WoW TCG and M:TG that use Lackey for organized play. I've had several of them point out this exact same issue. It seems very unlikely that this is an isolated issue with just us... is nobody else experiencing this or am I the only one pointing it out? Thanks, Trevor. We really appreciate all the work you've done on the program so far. Just wanted to bring it to your attention, since I hadn't seen it posted elsewhere. If there's any additional information I provide to help you isolate the issue, please let me know. Seconded. My co-worker and I play Magic at lunch, and Lackey has been great for helping us recall our adolescent years. We play using pools (loser of a round gets to add a pack to their pool), and we are having issue now that we are nearing 600 card pools. We did some testing and I figured it out. It seems that Lackey has a hard limit of 300 lines that I can take for a card pool. You can have as many cards as you want, but as soon as you exceed 300 different cards, it will stop adding cards from packs. Even if you edit the cardpool file, and manually add cards to the text file, Lackey will not parse any entries beyond the 300th line. Is there a similar limit with the amount of cards loaded to a given superzone? (Or superzones combined?) I'm trying to use lackey to play a game in which everyone draws from the same deck. After adding more of the expansions for a game where everyone draws from a single players deck, I've noticed this as well. It'd be nice if we could choose the amount of max cards in a zone like we choose the max amount of card images loaded. (If I can set LackeyCCG to load 1000 card images at a time, why not allow me to have them all loaded in one zone? (or even 2?).. Thanks for making such a simple to use engine. I'd like to be able to add more than 1000 unique cards to a cardpool (I need up to about 5000). How can I do this? unfortunately I need to ressurrect this one. I am also not able to add more than a certain amount of unique cards to a cardpool (see here). Is there any chance that this limitation can be removed / circumvented somehow? No chance? Thought this might be just a small correction?! Would really like to keep my entire collection in one cardpool in order to make deckbuilding and decktesting a more easy task!